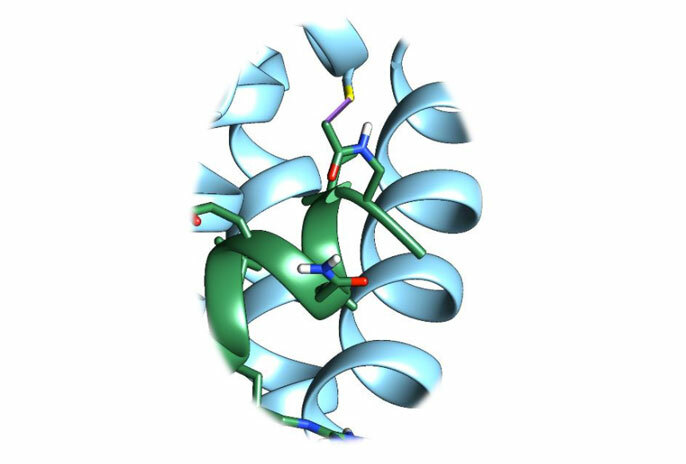 Close-up view of the structure of Bfl-1 (light blue ribbon with yellow stick representing a sulfur atom) in complex with the inhibitor 130G4 (green ribbon with red, oxygen, and blue, nitrogen, sticks). The bond between the Bfl-1 sulfur atom (yellow) and 130G4 is highlighted by a magenta stick. Every cell in our body produces pro-death proteins and anti-death proteins, which interact with each other, negating each other’s function. A healthy balance between them is a natural process. A damaged cell, for example, produces more pro-death proteins than anti-death proteins, resulting in a natural elimination of the diseased cell, a process also known as apoptosis. Pro- and anti-death proteins are therefore termed pro- and anti-apoptotic proteins, respectively. Anti-apoptotic proteins, therefore, have been the target for developing drugs that restore apoptosis in cancer cells. Bcl-2 is a member of a family of six anti-apoptotic proteins. It is the most studied of the six proteins, and the drug Venetoclax, approved by the Food and Drug Administration in 2016, targets it. When cancer cells are exposed to chemotherapy, radiation or even immuno-therapy, pro-apoptotic signals, such as the toxin NOXA, are produced in the cell that result in cancer cell death. Two anti-apoptotic proteins, Mcl-1 and Bfl-1, are known to oppose the effects of NOXA. Hence, inhibitors of these two anti-apoptotic proteins may complement Venetoclax in restoring apoptosis in cancer cells. Most efforts have been concentrated only on Mcl-1, because studies with mouse proteins have shown that NOXA interacts very tightly with Mcl-1 and sequesters it. But a team of researchers led by Maurizio Pellecchia at UC Riverside cautions that the focus needs to be on a different anti-apoptotic protein: Bfl-1. Maurizio Pellecchia is a professor of biomedical sciences and the Daniel Hays Endowed Chair in Cancer Research in the School of Medicine at UC Riverside. Study results appear in ACS Chemical Biology. Pellecchia’s lab found that NOXA interacts with Bfl-1 through a unique chemical bond (a “disulfide bridge” between unique sulfur atoms present on each protein) not seen in the other five anti-apoptotic proteins. The research was supported by the National Institutes of Health, the Chronic Lymphocytic Leukemia Research Consortium, the UC San Diego Foundation Blood Cancer Research Fund and the Bennett Family Foundation. Pellecchia was joined in the research by Elisa Barile (first author of the research paper), Guya D. Marconi, Surya K. De, Carlo Baggio, Luca Gambini, and Ahmed F. Salem at UCR; and Manoj K. Kashyap, Januario E. Castro, and Thomas J. Kipps at UC San Diego. Baggio and Gambini are postdoctoral scholars in Pellecchia’s lab; De and Salem are project scientists in his lab; Barile and Marconi are currently at UC San Diego. Why do some targeted cancer drugs lose effectiveness?